I have always found wildlife photography inspiring and calming to the soul. I wasn't far from land when I spotted this humpback whale just cruising near a rocky shelf, going at his own pace and rhythm. By the time the sun was starting to set I had him lined up with the lighthouse on Quirpon Island, Newfoundland. I enjoy the opportunity to mix scenic and wildlife photography together to create a mystical image. By the way - Quirpon Island Lighthouse is a great place to watch Humpback Whales, go kayaking and do some serious wildlife photography. Here you find more wildlife photography and pictures of animals. 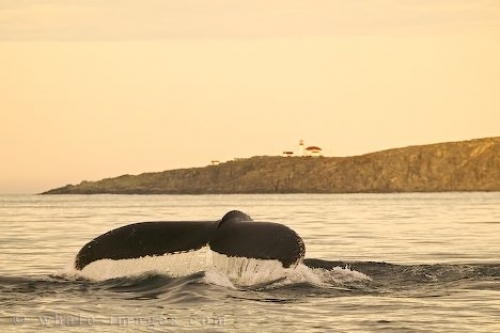 Picture of a Humpback Whale Fluke in Front of Quirpon Island Lighthouse off the Newfoundland coast.